This impressive vaulted path leads from the church on the crest of the island to another church outside the original fortified wall. It was probably built when the community expanded in the 6th Century AD. A Chrismas Past website in speculating that it was a major site for worship of St Nicholas says: "The island also has a huge Byzantine ecclesiastical complex, with a magnificent 300-meter barrel-vaulted processional way. 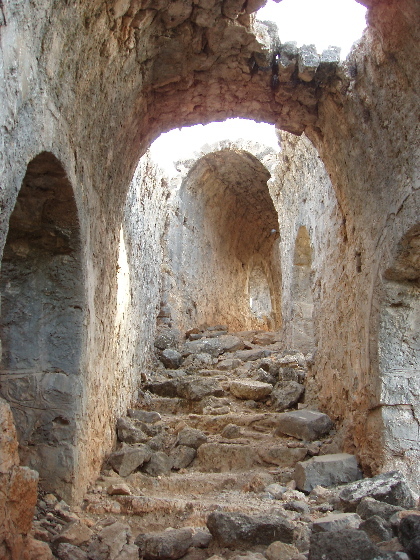 At other Byzantine sites processional roadways are often associated with monastic complexes dedicated to the veneration of major saints, but few ever reached the grandeur of the one at Gemiler."